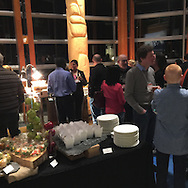 Between February 26 and March 1, 2015, the 2015 Canadian Retina Society (CRS) Meeting, Canada's premier educational event for retina specialists, took place in beautiful Whistler, British Columbia. The spectacular setting and cultural richness of North America's finest mountain resort provided the perfect backdrop for optimal learning, networking and adventure experiences for delegates attending this year's event. The meeting brought together an impressive breadth and scope of international and local expertise. The exceptional scientific program was delivered by guest speakers from Europe, the USA and Canada, with topics ranging from ocular trauma, cutting-edge surgical techniques to high-altitude ophthalmology. It was with great pride that CRS presented the Dr. Mila Oh Memorial Lecture for the first time. The CRS was honoured to welcome Dr. Brenda Gallie to present this inaugural lecture. For 40 years, Dr. Gallie and her research teams have focused on optimizing care for retinoblastoma; learning fundamental principles of cancer, genetics and translational medicine from this rare disease. Dr. Gallie's work further exemplified the international and local flavour of this year's meeting by showcasing how Canadian research is helping to make a difference in the lives of patients both here at home and around the globe. CRS would also like to thank The Retina Foundation of Canada for their generous support of this lecture. Also new this year, was the presentation of the results of the first-ever, made-in-Canada "Canadian Preference and Trends (CAN-PAT) Survey." Thanks to all the CRS members who took the time to complete the survey. The CAN-PAT survey data provided a fascinating glimpse into our daily choices in the clinic and we look forward to publishing the salient findings in the near future. We will be working on next year's survey and welcome your input as we design the questions. Please send your suggestions to Dr. Netan Choudhry at myhealthyretina@gmail.com. This year's meeting would not have been possible without the hard work and leadership of Dr. James Whelan, CRS President; Dr. Matthew Tennant, Co-Chair and CPD Director; and Dr. Netan Choudhry, Co-Chair. Next year, CRS looks forward to welcoming Dr. Pradeepa Yoganathan as Co-Chair, and Dr. Netan Choudhry as CPD Co-Chair.